Wow! Listening to Who Built The Moon? for the first time, it's like being hit by a steamtrain or an avalanche. The music rolls over me in waves and waves, without time for a pause. Noel Gallagher's High Flying Birds play in the highest gear possible and keep up that pace and musical artistry. Who Built The Moon? is its third album since the breakup of the U.K. band of the 90s. The two brothers Gallagher keep up the same tempo. Liam is of course the better singer. For the rest there's no comparison possible. Noel has shown abundantly that he can do without his baby brother and is a capable singer in his own right. He will never have the outgoing style of Liam though. It makes me wonder though about what could have been. There's no use to do so. It is time to get myself more familiar with this album. I will return after some more sessions. What keeps getting me is the abundance of energy that surges from the opening song 'Fort Knox'. As if the famous complex is sprung, robbed and blown up all within the same few minutes Noel Gallagher c.s. need to make an opening statement. The alarm bell keeps ringing to no avail. There's no rest for the wicked. 'Holy Mountain' continues in the same vein. Everything is closed up. All the energy is contained like in a black hole. There's simply no escape. All the little extra -and there are quite some to find- are like satellites orbiting the black hole, about to be sucked in. So yes, the production is massive. A wall of sound like Phil Spector used to create over 50 years ago. Is this a bad thing? Only if the songs are shite and I am totally inclined to think they are not. Would the album have profited from a less tight production? Who knows, there no way of knowing, is there? Noel's previous album, 'Chasing Yesterday' made it into my top 10 of favourite records of the year. (Read the review here: http://wonomagazine.blogspot.nl/2015/04/chasing-yesterday-noel-galleghers-high.html.) It is too early (so perhaps too late) to tell for this year. Yet with Who Built The Moon? Noel Gallagher proves he is relevant still and is a great songwriter and a proficient singer. Excitement is caught like it once was on Oasis records and a more modern sound is added to his songs. Dance elements are let in, making a song like 'It's A Beautiful World' sound different from all that came before. The man responsible for all that is producer David Holmes. A man with a lot of film scores to his name and a background in electronic music. He seems to have been able to draw Noel Gallagher head and heels into the 21st century. Without losing any of his old tricks off course. Just like with brother Liam's album 'As You Were' (read the review here: http://wonomagazine.blogspot.nl/2017/12/as-you-were-liam-gallagher.html) I will let you find all the references for yourself. It's part of the fun. Some might say some of the songs sound familiar. It is undeniable that songs have the Noel Gallagher touch. Close to 25 years after Oasis' first single release it's not strange to conclude that. But take a song like 'Black & White Sunshine'. It is signature Gallagher. And then that guitar chimes in playing all these fine notes, laid out over the swamp of sound as are a few other instruments. The sum of it all is such a pleasant song. The Interlude following it is the point of rest and reflection the album needs at that point and it provides. The end of Who Built The Moon? 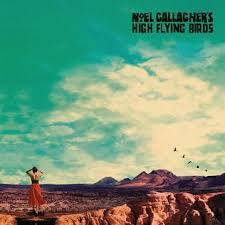 leaves room for only one conclusion: Noel Gallagher's High Flying Birds have released another fine album. Better than most of the Oasis albums after the first two for certain. All had their moments, some even multiple. Who Built The Moon? is excitement for the second decade of the 21st century. Starting with a big bang, ending with a fine song like 'The Men Who Built The Moon' and finally the second part of the interlude now called 'End Credits'. Yes, like film music. But hey, who was that producer again?